The Orange County Ronald McDonald House opened its doors 1989 with the mission of providing comfort, care, and support to families in Southern California. Caring for a child with a serious injury or illness can take a tremendous toll on families: financial, emotional, and psychological. Many travel long distances to access top pediatric care; they struggle to care for themselves and their children, to make complicated medical decisions, all while battling the isolation and uncertainty that accompanies a devastating diagnosis. 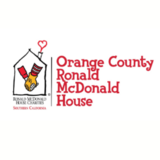 The Orange County Ronald McDonald House is designed to alleviate some of the burdens these caregivers face by providing a “home away from home” for families of critically ill children seeking advanced treatment at local pediatric centers. We're located adjacent to CHOC and several nearby facilities and support families from all over the world. OCRMH has not yet activated their merchant account with Givsum. Your donation will go to the GIVSUM Foundation who will issue a check to OCRMH ( less applicable fees ) as a grant within 30 days. You will get a tax receipt for the full amount of your donation from the GIVSUM Foundation, which you may use for your tax purposes.